I saw Air in concert last Thursday. It was the first concert I've been to (other than classical music) where I looked around and thought: I can beat up every dude in this auditorium, including the two guys on stage (JB Dunckel and Nicolas Godin). By chance, I scored the best tickets of my life in the pre-sale and ended up in the 2nd row, near the center of the main floor. 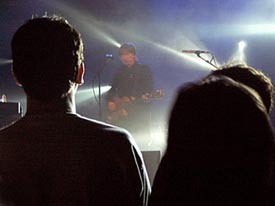 It provided a mostly unobstructed view of Air except when some zealous fans rushed to the stage during the encores to bop awkwardly to the difficult-to-dance-to ethereal tunes. 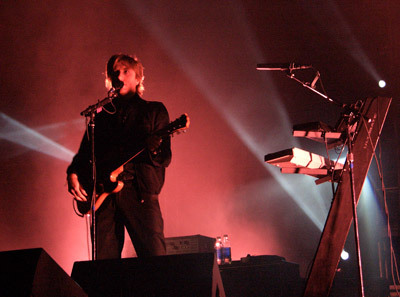 Air wasn't bad live, but their music isn't the type that's flattered by live performance. Electronic in nature, it plays better coming out of the CD player. Much of the concert was programmed and consisted of the two of them hitting a few keys or strumming a few chords while all sorts of computers played pre-programmed loops. If the rumors about Quentin and Sofia are true, will Air score one of Quentin's upcoming movies? Now that would be artistic dissonance of a very high order.